In the previous post, I showed you guys the difference of fake OPI and original OPI in terms of its aesthetic. 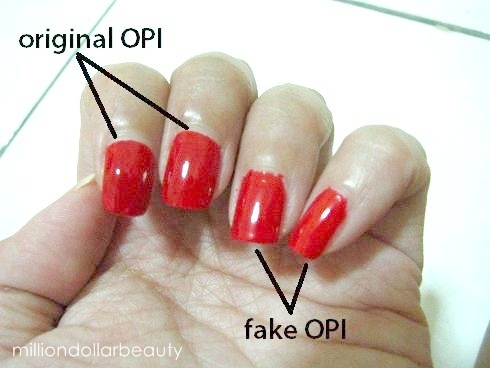 Basically, how you can tell between the original OPI and fake OPI by just looking at its bottle. In this post, I will do an experiment on the fake and original ones so you guys can judge the quality. I've chose two similar colors to put on my nails for test so that my fingernails don't look too awkward with different colors. The fake OPI has no name (of course!) 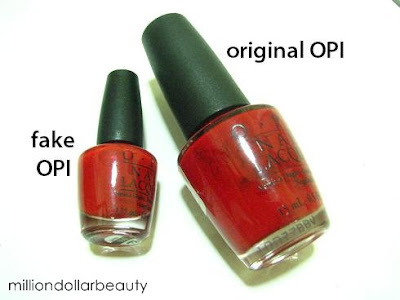 and the original OPI is Big Red Apple. The bristles of the fake OPI is really rough and it leaves streaks. 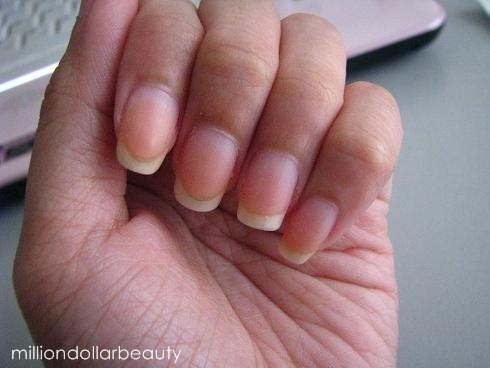 When you apply the lacquer on your nail, you can see obvious brush strokes. And the bristles are uneven - some length are longer and some are shorter. Because of that, it looks quite edgy on the cuticles. As compared to the original OPI, it has Pro-Wide brush which makes OPI nail polish a lot easier to apply on. The bristles are soft and doesn't leave streak lines. The original OPI brush really provides smooth and hassle free application. 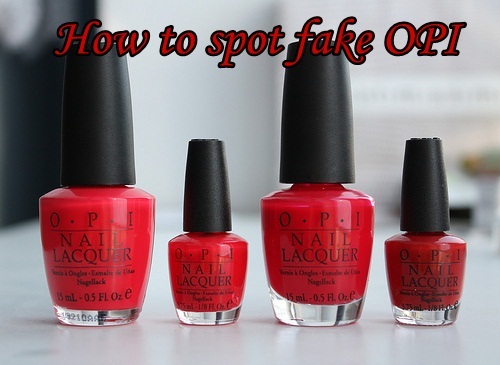 Texture wise, upon first layer of swatch, the fake OPI appears thin and the texture is watery. Original OPI texture is creamy and thick. As for effect, original OPI gives you more lustre. The fake one is not as smooth as the original OPI but it is still OK if you put on a top coat. Whereas, the original OPI is good on its own. The real result shows after a week of wearing both original and fake OPI. 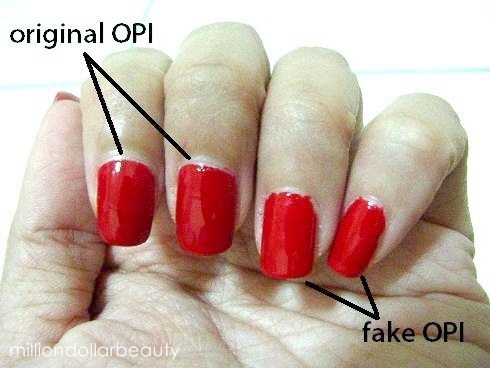 The fake OPI totally chipped off at the edge of my nails and at the cuticles. The original OPI still last and good to wear for another week. I didn't apply top coat for the purpose of this experiment. I believe if I apply original OPI top coat, it will last a very long time. When cleaning off the nail polish, the fake OPI consumes more nail polish remover. And I made quite a mess around my nails. As a result, there's a little peeling off on top of my nail. You probably can't see it in the photo. On the original OPI, there's nothing to complain of. 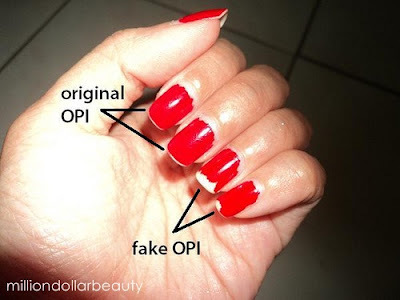 It is your prerogative if you want to buy the fake OPI. I have to admit, the price is really attractive. I think it's about RM10 a bottle. But why bother buying something so low quality, moreover when you know it is counterfeit item? For ease of mind, I would prefer using original OPI as there is a huge difference in terms of quality. Economically wise, I think the original OPI will give you higher return on investment. Although it cost RM59 a bottle, but it last much longer. If you calculate in terms of economic value, I think the original OPI is much cheaper as it only needs one coat for full capacity and last a lot longer than the fake OPI. FREE SHOES FOR YOU FOR THE WHOLE YEAR!!!!! NARS Pre-order (Malaysia Only) - CLOSED! Winner of November LUSH Soap Giveaway!